Hebrew translator; lived in Barcelona about 1230. He is supposed to have been the son of the poet Samuel ibn Abraham ibn Ḥasdai ha-Levi (1165-1216; Grätz, "Geschichte," vi. 195). Abraham Ḥasdai was an enthusiastic partizan of Maimonides, and took part in the struggle between the followers and the opponents of that philosopher. He sent a letter to Judah ibn al-Fakhar of Toledo (see Buxtorf, "Institutio Epistolaris Hebraïca," p. 433, Basel, 1729) in which he expressed the hope of converting him to the Maimonidean Party. At the same time he blamed himfor his attacks on the old grammarian David Ḳimḥi, and alluded to Meïr ben Todros ha-Levi Abulafia, the other principal adversary of Maimonides, in terms of censure. Moreover, he addressed a letter (Maimonides, "Teshubot, She'elot we-Iggerot," p. 346, Constantinople, 1520-40) to the same Abulafia, in which he expressed astonishment that a man of the latter's connections and position should unite with those who opposed Maimonides and despised a man like David Ḳimḥi. He addressed another letter, in conjunction with his brother Judah (see "Oẓar Neḥmad," ii. 171), to the Jews of Castile, Aragon, Navarre, and Leon, severely arraigning the anti-Maimonidists, who, in their fanaticism, had caused the monks to burn some of Maimonides' writings in Paris and Montpellier. Ibn Ḥasdai was an industrious translator from Arabic into Hebrew; some Arabic works are known only through his translations. Among his translations are the following: (1) "Sefer ha-Tappuaḥ," from the pseudo-Aristotelian "Kitab al-Tuffaḥah" (Venice, 1519, frequently reprinted; Latin transl. "Biga Dissertationum," Giessen, 1706; German transl. by J. Musen, Lemberg, 1873). The original Arabic text is lost. (2) "Mozene Ẓedeḳ," from Ghazali's ethical work entitled "Mizan al-'Amal." 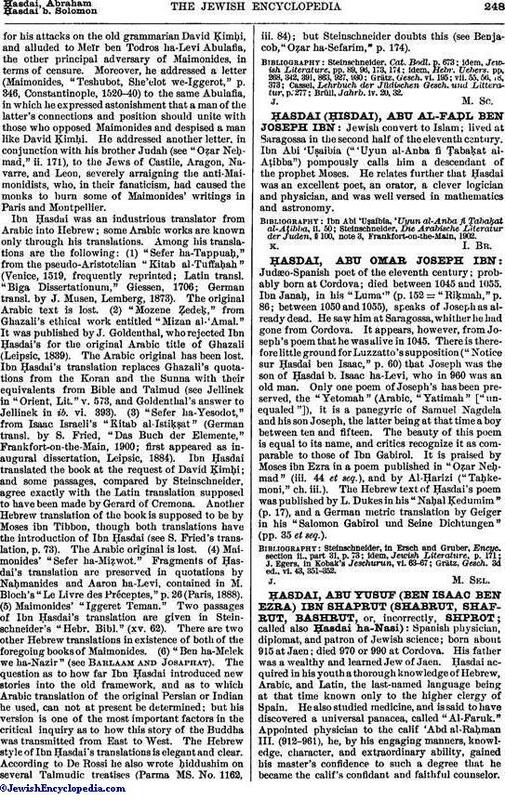 It was published by J. Goldenthal, who rejected Ibn Ḥasdai's for the original Arabic title of Ghazali (Leipsic, 1839). The Arabic original has been lost. Ibn Ḥasdai's translation replaces Ghazali's quotations from the Koran and the Sunna with their equivalents from Bible and Talmud (see Jellinek in "Orient, Lit." v. 573, and Goldenthal's answer to Jellinek in ib. vi. 393). (3) "Sefer ha-Yesodot," from Isaac Israeli's "Kitab al-Istiḳat" (German transl. by S. Fried, "Das Buch der Elemente," Frankfort-on-the-Main, 1900; first appeared as inaugural dissertation, Leipsic, 1884). Ibn Ḥasdai translated the book at the request of David Ḳimḥi; and some passages, compared by Steinschneider, agree exactly with the Latin translation supposed to have been made by Gerard of Cremona. Another Hebrew translation of the book is supposed to be by Moses ibn Tibbon, though both translations have the introduction of Ibn Ḥasdai (see S. Fried's translation, p. 73). The Arabic original is lost. (4) Maimonides' "Sefer ha-Miẓwot." Fragments of Ḥasdai's translation are preserved in quotations by Naḥmanides and Aaron ha-Levi, contained in M. Bloch's "Le Livre des Préceptes," p.26 (Paris, 1888). (5) Maimonides' "Iggeret Teman." Two passages of Ibn Ḥasdai's translation are given in Steinschneider's "Hebr. Bibl." (xv. 62). There are two other Hebrew translations in existence of both of the foregoing books of Maimonides. (6) "Ben ha-Melek we ha-Nazir" (see Barlaam and Josaphat). 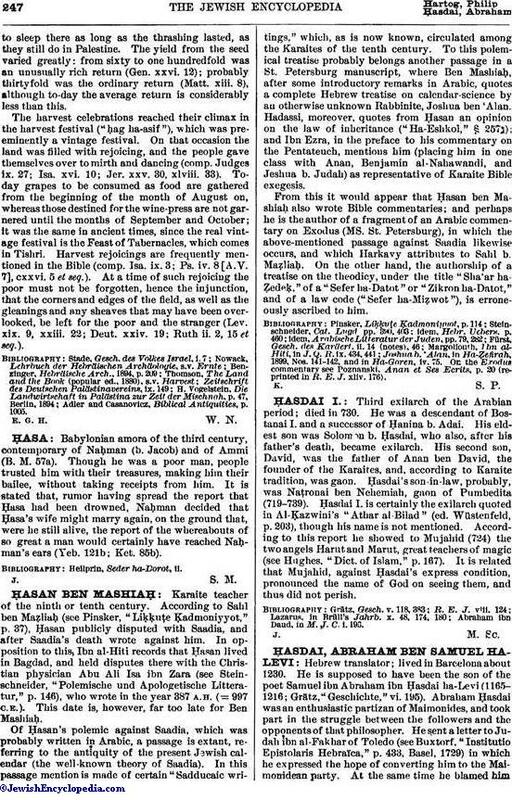 The question as to how far Ibn Ḥasdai introduced new stories into the old framework, and as to which Arabic translation of the original Persian or Indian he used, can not at present be determined; but his version is one of the most important factors in the critical inquiry as to how this story of the Buddha was transmitted from East to West. The Hebrew style of Ibn Ḥasdai's translations is elegant and clear. According to De Rossi he also wrote ḥiddushim on several Talmudic treatises (Parma MS. No. 1162, iii. 84); but Steinschneider doubts this (see Benjacob, "Oẓar ha-Sefarim," p. 174). Brüll, Jahrb. iv. 20, 32.